If you didn’t buy the 2018 Subaru WRX STI Type RA, you were smart for waiting. The new 2019 WRX STI gets engine upgrades like the Type RA making it a better value for performance fans and you don’t have to pay the extra premium of $10,400 over a base STI. It may not be as much as performance fans were hoping for, but the 2019 WRX STI gets a 5hp increase to 310hp with the help of a new air intake and high flow performance exhaust. A retuned ECU and stronger pistons also help increased engine performance in the 2019 STI. Like the Type RA engine, the torque is unchanged at 290 lb-ft, but the third gear ratio is more aggressive (1.590 instead of 1.521) in the six-speed manual gearbox to take advantage of the increased lower end torque. The 2019 WRX STI pricing begins at $36,595. That’s just a $500 price bump from the 2018 STI, and $9,900 less than the Type RA. 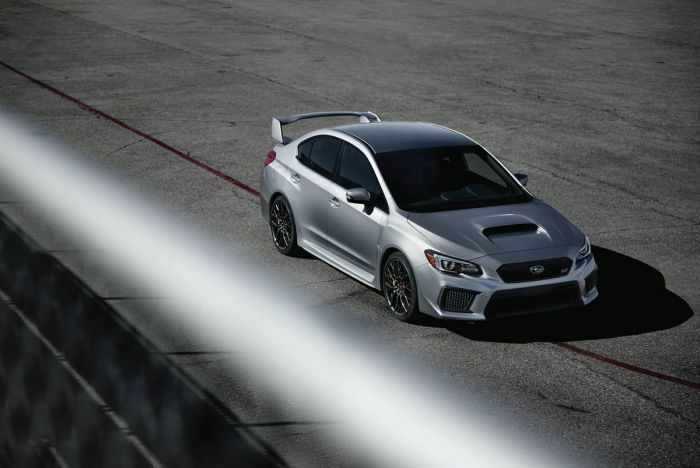 You don’t get the extra 19-inch wheels, and upgraded suspension with Bilstein-sourced and STI-tuned dampers, unless you opt for the new limited edition 2019 Subaru WRX STI Series.Gray priced at $39,695. The Type RA also comes with a carbon fiber roof not available on the 2019 STI. With a price tag of $49,855 including destination, the WRX STI Type RA is a hefty bump in price to pay, and many who drove the car didn’t think it was worth it. It’s also been reported that dealer markups on the STI Type RA were as much as $10,000 to $15,000 extra, bringing it to around $60,000-$65,000. You can buy the 2019 STI or wait for the new-gen model. The biggest change for the new-generation WRX/STI performance models will be the new Subaru Global Platform (SGP) they will ride on. Subaru WRX STI fans still want the aging EJ25 2.5-liter mill replaced with the new 2.0-liter direct injection FA20 power plant with a bump in power over the current 310hp on tap with the 2.5-liter boxer. Fans also want Subaru to bring back the hatch body style. Unfortunately, we don’t know what Subaru Corp plans to do, both are a possibility, but neither has been confirmed by Subaru. If you can wait, you’ll be able to get the all-new 2020-2021 WRX STI with the new SGP, possibly a new power plant, more power, and improved performance. Until then, the newly-upgraded performance-tuned 2019 Subaru WRX STI is a better value than the outgoing model, and a much better value than the STI Type RA. I am 2018 STI owner. I like the improvements on this new 2019 edition. Yes the STI is getting more and more interesting at a reasonable price. So they achieved to produce a great sounding STI, when I thought mine would have remain at an all-time high. I would welcome a new rumbling engine in the new gen, but in a way if it doesn't rumble Subaru will make my car a car that I will hold for many years and in that way Subaru will help my economy. If they decide to make a new rumbling STI I would like to have it and my economy will suffer.